In this article, we will learn some Visual Studio Code keyboard shortcuts while working on a Windows machine. 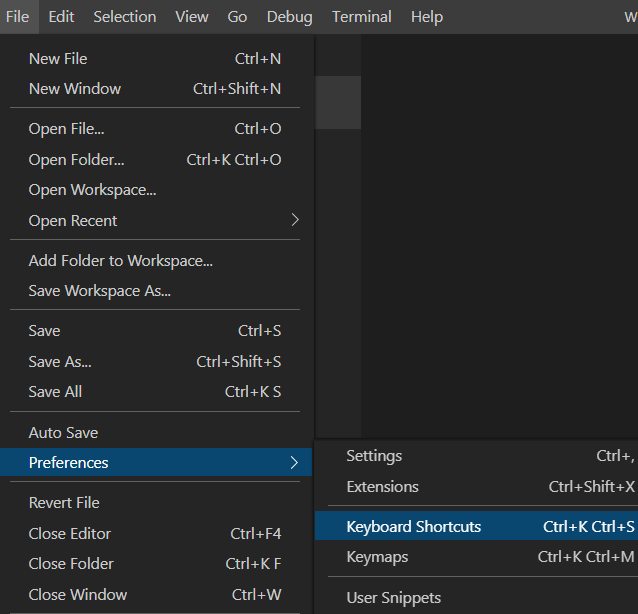 Visual Studio Code keyboard shortcuts are helpful to the developers in working faster and more efficiently and for boosting their working performance. Keyboard shortcuts are keys or combinations of keys that provide an alternative way to do something. 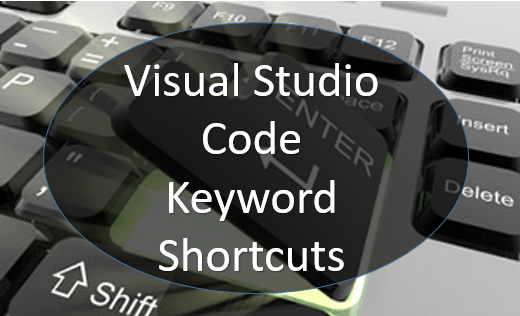 These shortcuts can provide an easier and quicker method of using Visual Studio Code. I have categorized all the shortcut keys into the following categories. We can also check all shortcuts keys using the following command. These 5 evergreen goals are a useful way to help technology organizations of all sizes make decisions, categorize work, allocate resources, and spur innovation and productivity without interfering with team-specific, time-boxed goals. Whether you’re leading through change or focusing your team, these evergreen goals (or your variations of them) might just be what you need to bring foundational consistency to your technology organization without slowing them down. Here’s our set of evergreen goals. Some systems might be complex because the problems they address are complicated. Perhaps the complexity is justified. That said, it’s startling how much complexity is created unintentionally. This evergreen goal is focused on reducing accidental or unintentional complexity. Sometimes it’s created because of expediency, but often it’s the result of architecture that does not evolve properly. The end result is the same, however. You probably see this in some of your own systems as they become increasingly difficult to fix or improve in a timely manner without causing problems in other areas. Unintentionally complex systems are also difficult to secure, scale, move, and recover. I’ve seen this at startups as well as at long standing companies like Morningstar with lengthy histories of product development, acquisitions, and integration. This goal is not only about technology but is also about reducing complexity in the processes that drive how we we plan, work together, communicate, and hire. Technology teams often cut corners in order to deliver promised functionality on schedule. Regardless of why or how that happens, it does. The purpose of this evergreen goal is to encourage teams to always think intentionally about product completeness. We challenge our teams to continually find ways to improve security, scalability, and resilience, for example, and not just ways to deliver new functionality. Completeness work is often very underappreciated until something terrible happens. Don’t wait until you experience a data breach, extended downtime, or an inability to scale before you think about product completeness. Be pragmatic, but don’t be foolish. Delivering a product (internal or otherwise) is one thing, but keeping it up and running is an operational challenge that is often an afterthought in many organizations. The purpose of this evergreen goal is to encourage teams to think about monitoring, alerting, logging, incident response, recoverability, and automation. This isn’t just about technology. It’s also about ensuring that operations processes are efficient, modern, updated, and focused on the customer. Identify and correct problems before your customers report them. They expect that from you. In this modern age of high quality public cloud infrastructure, it makes little sense for most companies to run their own data centers for most of their workloads. It’s rarely a business differentiator anymore. Obviously, this evergreen goal might only apply to you if you’re still running your own data centers, but also consider other infrastructure you might own. Do you have your own call center equipment, for example? It might be worth rethinking that. At Morningstar, we are in the middle of a multi-year cloud transformation and this goal is particularly important to us. The purpose of this goal is to encourage teams to find ways to reduce current infrastructure footprints so that we can continue to draw down our dependence on the infrastructure that we own and maintain. The technology landscape is changing so quickly and access to rich web services is abundant. A quick look at any major cloud service provider reveals that they’ve moved well beyond infrastructure services into services that spur innovation and increase productivity. Look at all the services related to machine learning, for example. Hopefully, you’ve hired people not just for what they already know but also for their aptitude and desire for continuing education. The tendency for many companies is to hire from the outside without first considering modernizing the skill sets of people they already have in-house. The modern workforce expects companies to invest in professional development, so this evergreen goal to maximize talent is a constant reminder to do that. It benefits individuals, teams, and the overall business to re-skill in-house talent. Remember though, that you cannot immediately change culture. You have to nurture and evolve it. Installing and promoting these evergreen goals is often like creating a new habit or lifestyle change. It requires commitment, persistence, repetition, and encouragement. Use the terminology and concepts in meetings, conversations, and presentations, and encourage others to do the same. Make the effort inclusive, sustained, and intentional. The overall purpose for these evergreen goals is to remove friction from your technology organization in order to spur innovation and increase productivity. Sometimes simple measures like these yield the most impressive results. The Angular framework allows developers to create dynamic, single-page web applications (SPAs). When Angular was first released, its main benefit was its ability to turn HTML-based documents into dynamic content. In this article, we focus on the newer versions of Angular, commonly referred to as Angular 2+ to address its distinction from AngularJS. Angular is used by Forbes, WhatsApp, Instagram, healthcare.gov, HBO, Nike, and more. The framework ecosystem defines how seamless the engineering experience will be. Here, we’ll look at the main tools commonly used with Angular and React. First of all, React is not really a framework, it’s a library. It requires multiple integrations with additional tools and libraries. With Angular you already have everything to start building an app. RxJS is a library for asynchronous programming that decreases resource consumption by setting multiple channels of data exchange. The main advantage of RxJS is that it allows for simultaneous handling of events independently. But the problem is that while RxJS can operate with many frameworks, you have to learn the library to fully utilize Angular. 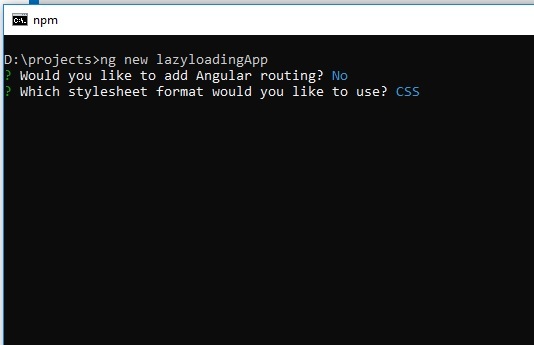 Angular CLI is a powerful command-line interface that assists in creating apps, adding files, testing, debugging, and deployment. Dependency injection - The framework decouples components from dependencies to run them in parallel and alter dependencies without reconfiguring components. Ivy renderer - Ivy is the new generation of the Angular rendering engine that significantly increases performance. Angular Universal is a technology for server-side rendering, which allows for rapid rendering of the first app page or displaying apps on devices that may lack resources for browser-side rendering, like mobile devices. Aptana, WebStorm, Sublime Text, Visual Studio Code are code editors commonly used with Angular. Jasmine, Karma, and Protractor are the tools for end-to-end testing and debugging in a browser. React requires multiple integrations and supporting tools to run. Redux is a state container, which accelerates the work of React in large applications. It manages components in applications with many dynamic elements and is also used for rendering. Additionally, React works with a wider Redux toolset, which includes Reselect, a selector library for Redux, and the Redux DevTools Profiler Monitor. 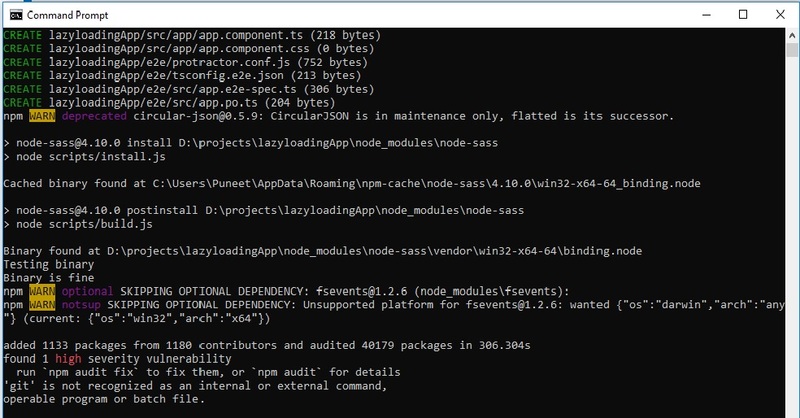 Webpack - As all components are written in different files, there’s a need to bundle them for better management. Webpack is considered a standard code bundler. React Router - The Router is a standard URL routing library commonly used with React. Similar to Angular, you’re not limited in terms of code choice. The most common editors are Visual Studio Code, Atom, and Sublime Text. Enzyme and Unexpected-react – for component testing. react-testing-library – for React DOM testing. React-unit – for unit testing. Skin-deep – for Render testing utils. This toolset is also supplied by Reselect DevTools for debugging and visualization and React Extension for Chrome React Developer Tools and React Developer Tools for Firefox and React Sight that visualizes state and prop trees. Generally, both tools come with robust ecosystems and the user gets to decide which is better. While React is generally easier to grasp, it will require multiple integrations like Redux to fully leverage its capacities. Both frameworks have component-based architectures. That means that an app consists of modular, cohesive, and reusable components that are combined to build user interfaces. Component-based architecture is considered to be more maintainable than other architectures used in web development. It speeds up development by creating individual components that let developers adjust and scale applications with a low time to market. Document Object Model (DOM) is a programming interface for HTML, XHTML, or XML documents, organized in the form of a tree that enables scripts to dynamically interact with the content and structure of a web document and update them. There are two types of DOMs: virtual and real. Traditional or real DOM updates the whole tree structure, even if the changes take place in one element, while the virtual DOM is a representation mapped to a real DOM that tracks changes and updates only specific elements without affecting the other parts of the whole tree. React uses a virtual DOM, while Angular operates on a real DOM and uses change detection to find which components need updates. While the virtual DOM is considered to be faster than real DOM manipulations, the current implementations of change detection in Angular make both approaches comparable in terms of performance. Data binding is the process of synchronizing data between the model (business logic) and the view (UI). There are two basic implementations of data binding: one-directional and two-directional. 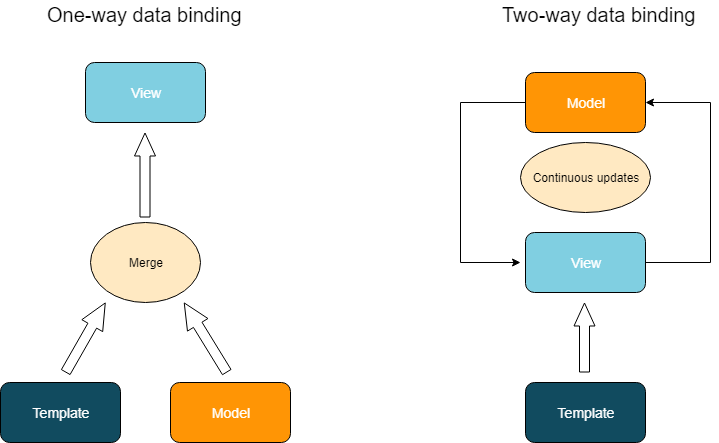 The difference between one- and two-way data binding lies in the process of model-view updates. Two-way data binding in Angular is similar to the Model-View-Controller architecture, where the Model and the View are synchronized, so changing data impacts the view and changing the view triggers changes in the data. React uses one-way, or downward, data binding. One-way data flow doesn’t allow child elements to affect the parent elements when updated, ensuring that only approved components change. This type of data binding makes the code more stable, but requires additional work to synchronize the model and view. Also, it takes more time to configure updates in parent components triggered by changes in child components. One-way data binding in React is generally more predictable, making the code more stable and debugging easier. However, traditional two-way data binding in Angular is simpler to work with. AngularJS is famous for its low performance when you deal with complex and dynamic applications. 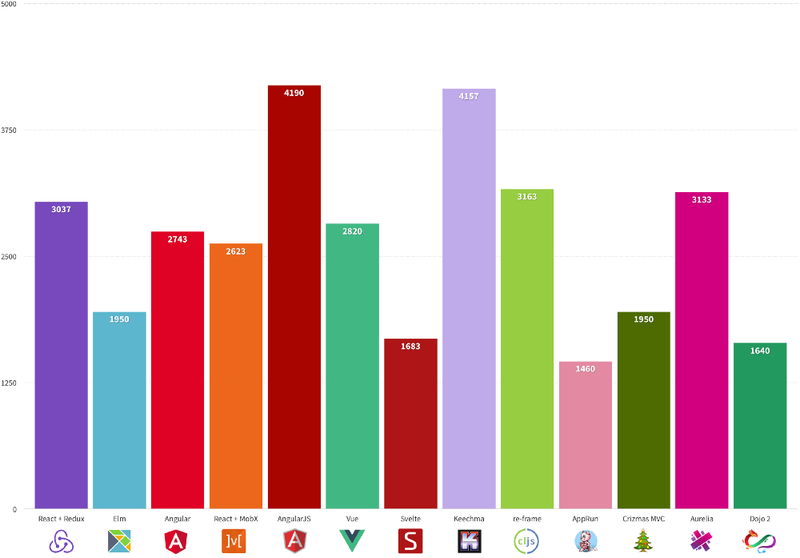 Due to the virtual DOM, React apps perform faster than AngularJS apps of the same size. However, newer versions of Angular are slightly faster compared to React and Redux, according to Jacek Schae’s research at freeCodeCamp.org. Also, Angular has a smaller app size compared to React with Redux in the same research. Its transfer size is 129 KB, while React + Redux is 193 KB. The recent updates to Angular made the competition between the two even tenser as Angular no longer falls short in terms of speed or app size. Angular. The Material Design language is increasingly popular in web applications. So, some engineers may benefit from having the Material toolset out of the box. Angular has pre-built material design components. Angular Material has a range of them that implement common interaction patterns: form controls, navigation, layout, buttons and indicators, pop-ups and modules, and data tables. The presence of pre-built elements makes configuring UIs much faster. React. On the other hand, most of the UI tools for React come from its community. Currently, the UI components section on the React portal provides a wide selection of free components and some paid ones. Using material design with React demands slightly more effort: you must install the Material-UI Library and dependencies to build it. Additionally, you can check for Bootstrap components built with React and other packages with UI components and toolsets. Both frameworks come with additional tools that allow engineers to port the existing web applications to mobile apps. We’ve provided a deep analysis and comparison of both NativeScript (Angular) and React Native. Let’s briefly recap the main points. Generally, both frameworks are a great choice if you need to run both web and mobile apps with the same business logic. While NativeScript is more focused on code sharing and reducing time-to-market, the ideas behind React Native suggest longer development terms but are eventually closer to a native look and feel. Angular was created by Google and the company keeps developing the Angular ecosystem. Since January 2018, Google has provided the framework with LTS (Long-Term Support) that focuses on bug fixing and active improvements. 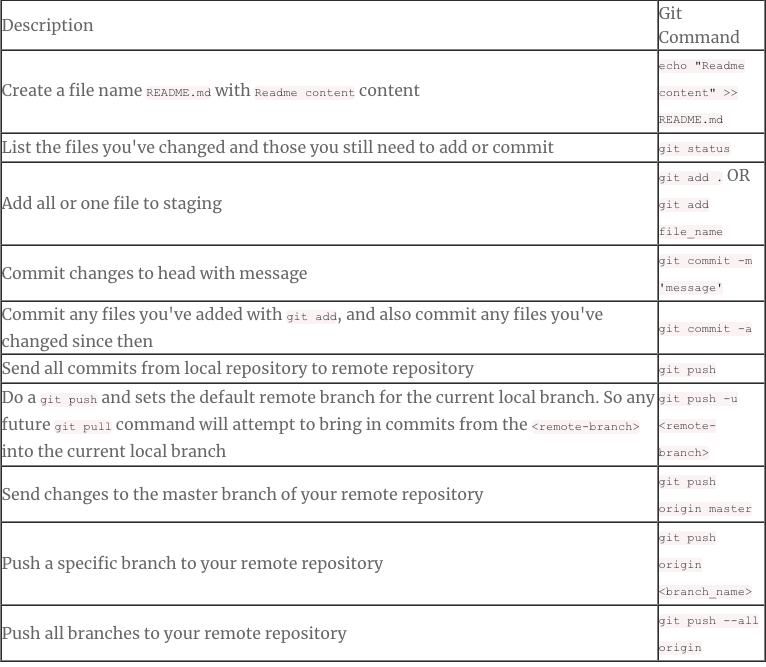 Despite the fast development of the framework, the documentation updates aren’t so fast. 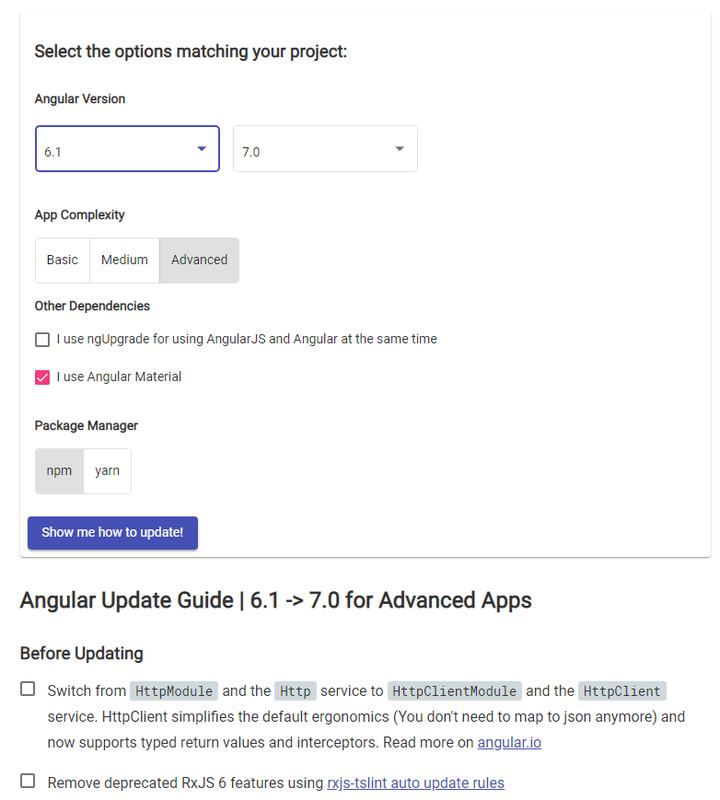 To make the Angular developer’s life easier, there’s an interactive service that allows you to define the current version of the framework and the update target to get a checklist of update activities. AngularJS documentation and tutorials are still praised by the developers as they provide broader coverage than that of Angular 2+. Considering that AngularJS is outdated, this is hardly a benefit. Some developers also express concerns about the pace of SLI documentation updates. The React community is experiencing a similar documentation problem. When working with React, you have to prepare yourself for changes and constant learning. The React environment and the ways of operating it updates quite often. React has some documentation for the latest versions, but keeping up with all changes and integrations isn’t a simple task. However, this problem is somewhat neutralized by the community support. React has a large pool of developers ready to share their knowledge on thematic forums. The learning curve of Angular is considered to be much steeper than of React. Angular is a complex and verbose framework with many ways to solve a single problem. It has intricate component management that requires many repetitive actions. React remains more popular than Angular on GitHub. It has 113,719 stars and 6,467 views, while Angular has only 41,978 and 3,267 stars and views. 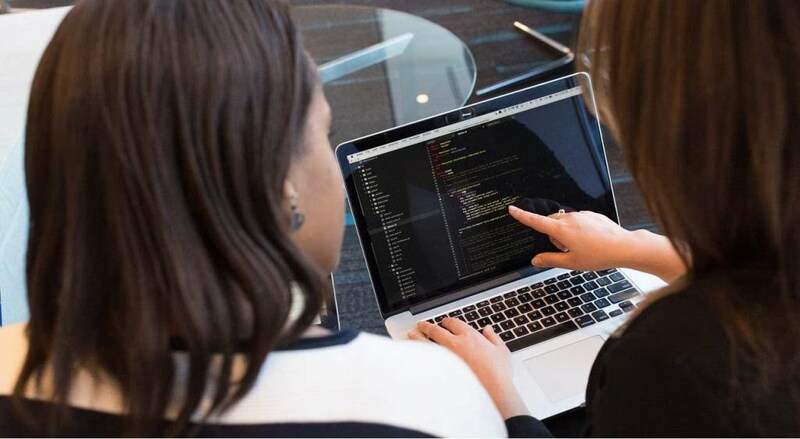 But according to the 2018 Stack Overflow Developer Survey, the number of developers working with Angular is slightly larger: 37.6 percent of users compared to 28.3 percent of React users. 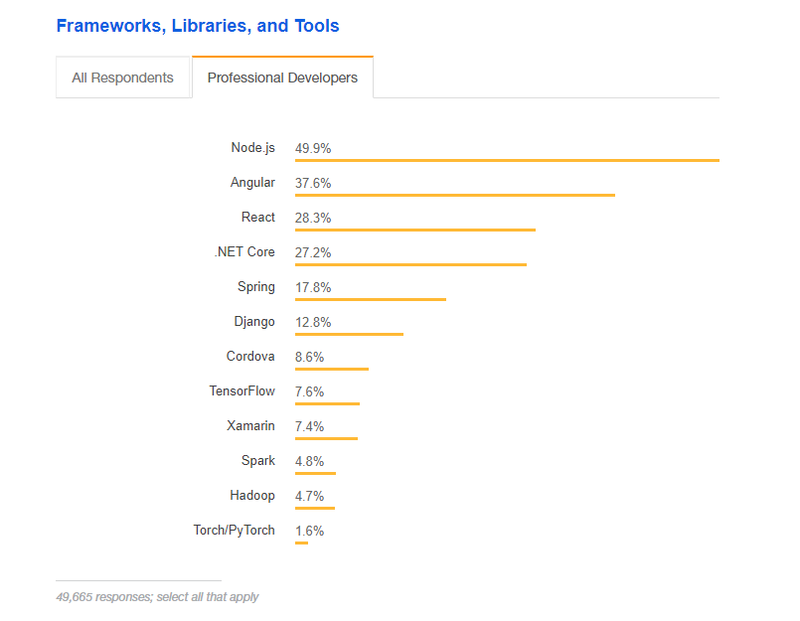 It’s worth mentioning that the survey covers both AngularJS and Angular 2+ engineers. Angular is actively supported by Google. The company keeps developing the Angular ecosystem and since January 2018, it has provided the framework with LTS (Long-Term Support). However, Angular also leads in a negative way. According to the same survey, 45.6 percent of developers consider it to be among the most dreaded frameworks. This negative feedback on Angular is probably impacted by the fact that many developers still use AngularJS, which has more problems than Angular 2+. But still, Angular’s community is larger. The numbers are more optimistic for React. Just 30.6 percent of professional developers don’t want to work with it. Which Framework Should You Choose? The base idea behind Angular is to provide powerful support and a toolset for a holistic front-end development experience. Continuous updates and active support from Google hint that the framework isn’t going anywhere and the engineers behind it will keep on fighting to preserve the existing community and make developers and companies switch from AngularJS to a newer Angular 2+ with high performance and smaller app sizes. TypeScript increases the maintainability of code, which is becoming increasingly important as you reach enterprise-scale applications. But this comes with the price of a steep learning curve and a pool of developers churning towards React. React gives a much more lightweight approach for developers to quickly hop on work without much learning. While the library doesn’t dictate the toolset and approaches, there are multiple instruments, like Redux, that you must learn in addition. 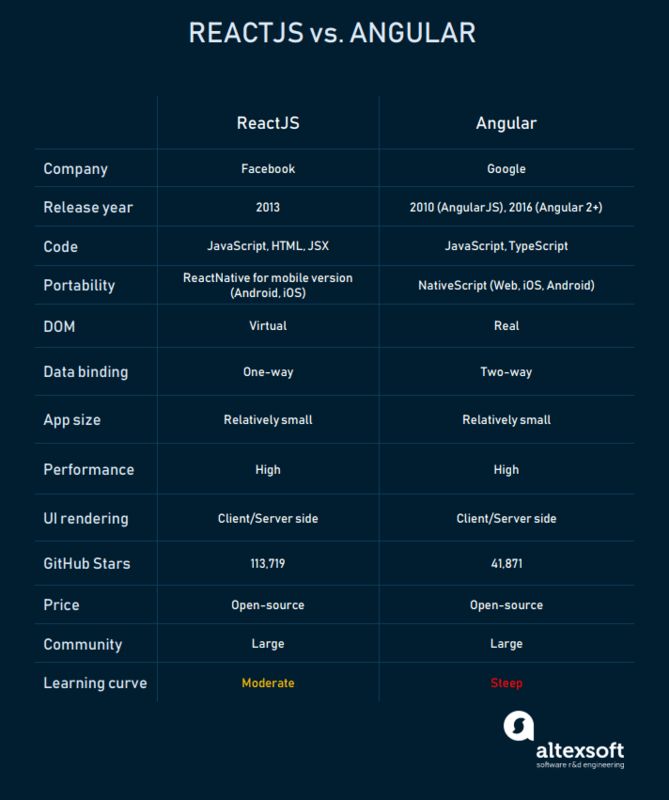 Currently, React is comparable in terms of performance to Angular. These aspects make for broader developer appeal. Originally published on AltexSoft Tech Blog "React vs. Angular Compared: Which One Suits Your Project Better?"